The players curiously slide aside old junk in the messy attic. But what's hiding underneath? Hungry monsters appear under the junk. Players who keep an overview and remember where the hungry monsters are hiding can draw delicious food in the monster's mouths. But be careful; a monster that has already been fed scares players toward the exit with a fearsome burp. Who will manage to stay in the attic longest? 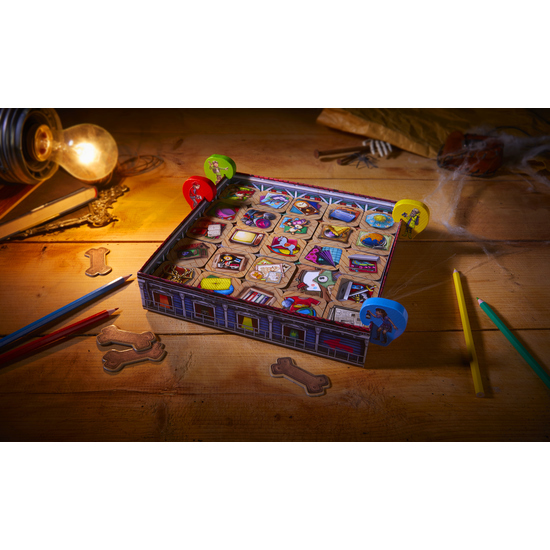 Contents: 1 attic (consists of: box base, insert, grid made up of 4 pieces, 1 attic floor board, 1 monster game board, 24 tiles showing attic junk), 10 white sheets of paper, 4 play figures, 4 colored pencils, 4 bone tiles, 1 set of instructions. Short game instructions: • Set up the game board according to the instructions; take a bone tile, a play figure and a pencil of the same color. Hang the play figure on the starting field on side of box. • Take turns to slide up to four junk tiles in a row, and feed the monster that appears underneath by drawing a monster snack on the sheet in the monster‘s mouth. • If the monster has already been fed, move the play figure forward. • When the play figure reaches the guard dog hand over your bone. • If a player doesn‘t have a bone to give the guard dog, they leave the game. The last player to remain wins the game.